28 Days to Fit, Fierce & Fabulous! Fit, Fierce & Fabulous is a 28 day program that encompasses the Tone It Up lifestyle! The New York Times Bestselling book (!!!) incorporates new workouts, lifestyle tips, and daily spiritual challenges to transform your mind and body! In the book, Katrina and I share our heart-felt stories of how fitness helped us overcome life’s obstacles to live our life to the fullest. You’ll love all the new stories, beauty secrets, and girl talk! 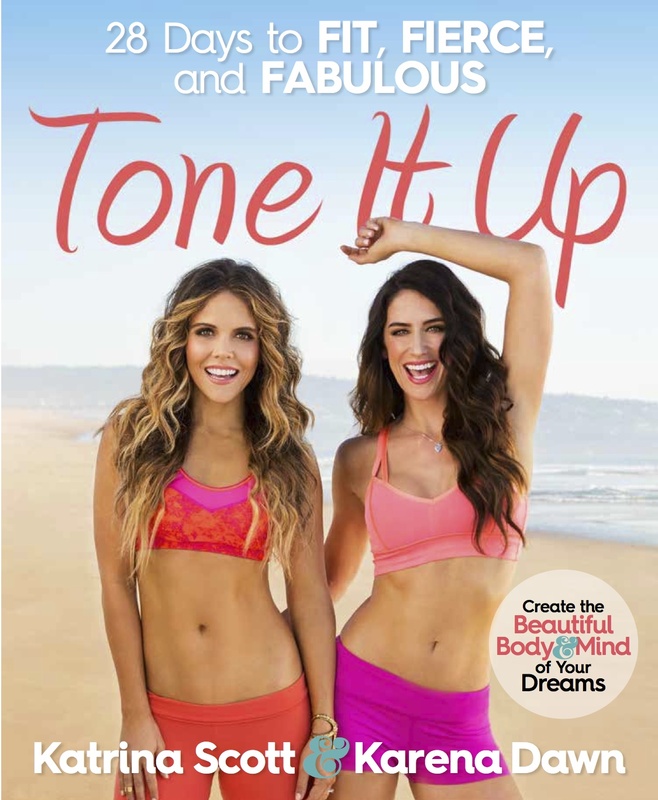 This book is a perfect companion to your Tone It Up Nutrition Program! Barnes & Noble, or on AMAZON! Get ready to be FIT, FIERCE & FABULOUS! ♥ FIT. Daily fitness challenges, workout plans, and moves to make you feel so toned & FIT! ♥ FIERCE. Empower and align your mind and body with your intentions through visualization exercises, daily meditations, and confidence-boosting tips. Get ready to move outside your comfort zone! ♥ FABULOUS. This is the fun stuff: beauty, friendship, inspiration, joy, and all the things that give you an unmistakable glow that radiates from the inside out! Order your copy of the New York Times Bestseller at any of the retailers below. We can’t wait to see you with your copy! Hashtag #FitFierceFab on Instagram! :) We have so much in store for the community and can’t wait to celebrate with you! Order at any of these retailers…. click on their logo! Here’s a peek from behind the scenes of the photo shoot for the book! Love our team Nicole Hill, John Segesta, Jenna Anton, Rodale Press, Cindy, Eileen, Debra, Marisa, our family, our TIUteam, this incredible community, & everyone who made this dream possible!! TONE IT UP BOOK TOUR PICS!!!! Thank you again to everyone who came to meet us on tour!!! It was such a thrill to meet each and every one of you :) We hope to do more events in the future where we get to workout with you and meet even more TIU girls!!! Thank you for writing this book! Just completed the 28 day challenge! It was fun and rewarding in more ways then the inches I lost! I just finished my 28 days. LOVED it! It helped me become more positive about myself. It was fun and easy to do. Im so glad I have this book! random question – how tall are you girls?! Are you still coming to San Diego on August 1st? I would love to meet you both! You are such a huge inspiration! your comment really made me realize that i need to get myself in gear, i just got an outbreak of hives for the first time over stress as well so im going to take your positive energy and get the book and stick to it. thank you for the motivation!! Hi!! I´m from Mexico, and I really want your book!! How can i get it?? Please tell me!! Hey! I am looking for an accountable gal who is also doing the 28 day book challenge! The book mentioned there was a link on the website with a community for this stuff? Can’t seem to find it. I was looking for the same link–did you ever find it? Same here. Need to find a Bombshell buddy! Girls where are your swim tips from? The picture at the very top? I just started the 28-day challenge! I was hoping to find the link you mentioned in the book for finding a local community of Tone It Up gals? I am just getting ready to start. I am very excited. It is so nice seeing that it has worked for a lot of people. Ok girls!! Two questions: 1. I feel like I’m too out of shape & too old to get my former competitive gymnast body back!! (YIKES-5 kids later). 2. My teenage daughter & I want to know where to find your clothing?? Links? Thanks! Hello Ladies! So I just started the the TIU #FitFierceFab challenge yester day and was wondering if anyone was looking for a bombshell buddy. If so please let me know so that we can hopefully keep eachother motivated and focused on out goals. Hey Bethany! So glad you’re loving the program. For the mermaid moves, you can start with 1 set and work your way up to 3 as you feel ready. No rush though ~ make sure you’re listening to your body. Keep up the amazing work! !